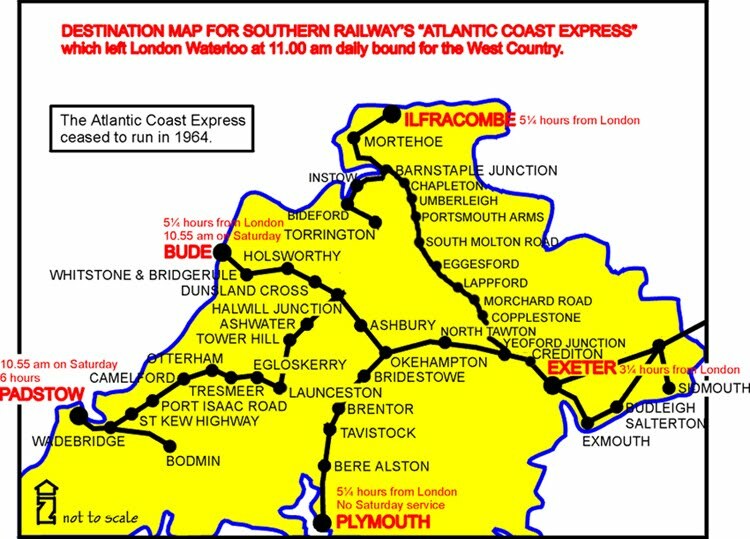 The ”North Cornwall & Bude Express” ran from 1907, until, as part of a publicity drive by Southern Railways, the 11 o’clock from Waterloo to the West Country was named the “Atlantic Coast Express” in July 1926. The “Atlantic Coast Express’ very soon became affectionately known to many travellers and enthusiasts as the “ACE”, the shortened version of its full title. The Last "Atlantic Coast Express" left Padstow on the 5th September 1964, this famous train that had for so long linked London with the invigorating holiday environment of North Cornwall’s Atlantic Coast ceased to exist. Lines south of Okehampton were closed some two years later and the era of steam and rail travel in much of rural Devon and Cornwall came to an end. Copyright © 1999-2015 Edward Gregory & Atlantic Highway Ltd - All photographs/images/graphics/maps/logos copyright to their relevant owners.